I’m sure I don’t have to tell you about the enormous amount of tropical fruits that can be found in Colombia. From well known fruits like pineapple, mango, watermelon, to lesser known fruits like mamoncillo (Spanish lime) and my favorite, granadilla. It is for this reason that in most Colombian cities you find all kinds of great treats like raspado, cholado, and in this case, salpicón, which is a fruit cocktail with a ton of Colombia flavor. When I was a kid the drink that was mainly used to make this salpicón was a very popular soda called Colombiana, it’s supposed to have a slight champagne flavor but in my opinion it doesn’t taste anything like it. What I do know is that it tastes really good and it’s almost impossible for me to find it in the city I currently live and many times I have to order it online. Today, a good salpicón can be made with any kind of drink, without a doubt my all time favorite is making it with any strawberry flavored soda, mainly because it reminds me of the Colombian soda, Premio, which I have always loved, but you can also make it with an orange flavored soda or make it even more healthy by using natural juice like strawberry or watermelon. 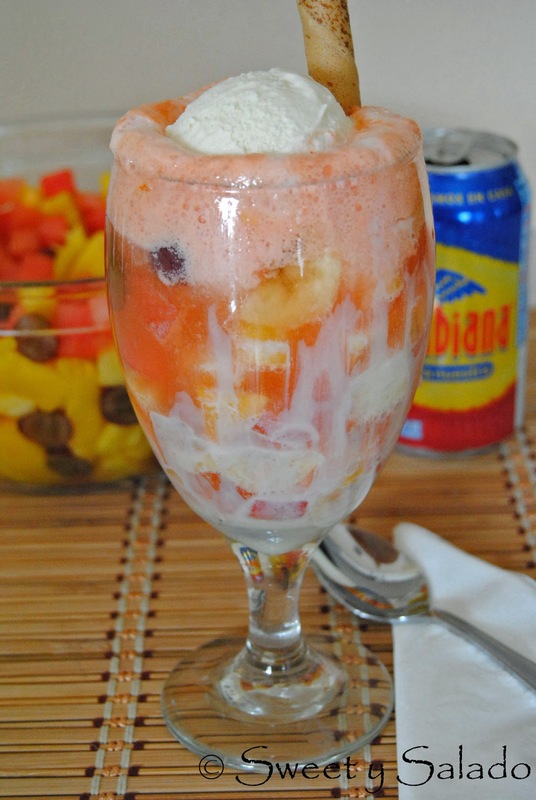 The best part about this fruit cocktail is that once you eat the fruit you are left with the mixture of the soda, the condensed milk and the ice cream which is so good it’ll make you go for seconds. 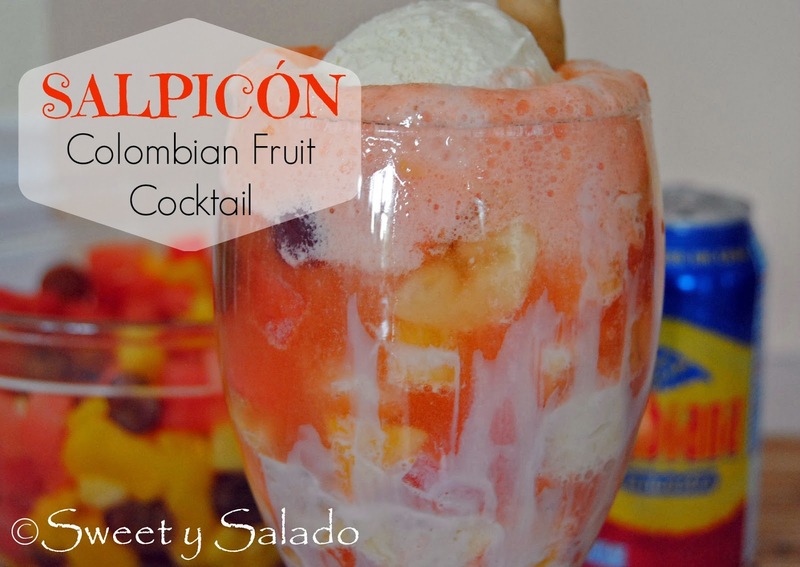 This amazing salpicón can be made with any kind of fruit and it has a lot of Colombian flavor. 1. Mix all fruit in a large bowl. **Note: the bananas should be added right before serving because they tend to turn brown over time. 2. Cover the inside of your serving glass with the condensed milk. 3. Fill up the glass with the fruit just over half way full. 4. Add the soda or juice leaving room for the ice cream. 5. Top with a scoop of vanilla ice cream and serve it with a wafer for decoration. Colombiana tastes a lot like cream soda here in the US. Mmm… yeah, I can see that. It is definitely different and I always grab a ton whenever I see it at my local Latin grocery store because it is rare.